The family of Israeli soldier Gilad Shalit and thousands of supporters began a protest march to mark the four years of his captivity. Under the slogan “Gilad is still alive,” at least 2,000 supporters on Sunday joined Shalit’s family on a march from northern Israel to Jerusalem, a 120-mile walk that is expected to take about 12 days. The march, which left from the family’s home in Mitzpe Hila near the Lebanese border, will make stops in sites significant to the family. On Sunday afternoon, the march stopped at the high school Shalit attended in Kibbutz Cabri. In Jerusalem, the family will sit in a protest tent erected across from the Prime Minister’s Office. “We have waited four years and Gilad is still waiting — those who sent him there must bring him home,” Noam Shalit, Gilad’s father, said as the march set off. Shalit was captured in a cross-border raid on June 25, 2006 and is believed being held by Hamas in Gaza. Hamas has said it is waiting for hundreds of prisoners to be released to Israel, the West Bank and Gaza, as well as other Arab countries, including prisoners directly responsible for the deaths of Israelis, before it will release Shalit. Prime Minister Benjamin Netanyahu called Noam Shalit before the march began and invited him to meet when the march reaches Jerusalem. Human Rights Watch urges Hamas to give Red Cross access to abducted soldier; Shalit family: We’ll protest in Jerusalem until Gilad is free. Rally urging the release of Gilad Shalit in Tel Aviv, June 25, 2010. A convoy of motorcyclists was also to spread out to the embassies of each of the United Nations permanent Security Council members, urging the international states to pressure Hamas for Shalit’s release. The Haifa municipality has planned a mass vigil for the evening, when demonstrators will unleash 6,000 balloons to commemorate the soldier’s capture. Another demonstration was planned outside of the International Red Cross’s office in Israel. // The Shalit family will begin on Sunday a march to Jerusalem, where the plan to demonstrate outside of Prime Minister Benjamin Netanyahu’s official residence – embarking on a quest they say will end only with Gilad’s return. It is not clear how long the Shalit family and the activists campaigning for his release will have to camp in protest opposite the prime minister’s residence in Jerusalem until he decides to bring Gilad home. It is clear that the battle will be hard and long, and that public opinion will play a key role in the outcome. Shalit was snatched on June 25, 2006. Hamas, which is holding him, has released only three letters from him, an audio recording, and a video recording. The Islamist movement has refused requests by the Red Cross and by HRW to visit the captive, saying that to do so could reveal to Israel where he was being held. “The laws of war prohibit cruel and inhuman treatment of persons in custody. They also require a party to a conflict to permit persons deprived of their liberty to correspond with their families and not to refuse arbitrarily a request by the ICRC to visit detainees,” the HRW statement said. Hamas is demanding the release of hundreds of Palestinians in return for Shalit. Attempts to organize a prisoner swap, conducted through Egyptian, and then German, mediation, have so far failed. Senior Hamas official Mahmoud a-Zahar told Israel Radio on Friday morning that his organization cut ties six months ago with the German official mediating the swap, and have not renewed the contacts since. He said the mediator would return to the region when there was a new exchange proposal on the table. According to Zahar, Israel had backed down from previous agreements on the matter, and the impasse in the swap talks was due to Israel’s refusal to free several prisoners whose release Hamas demands, and on its insistence that freed Hamas prisoners from the West Bank be exiled to the Gaza Strip. He added that he had no idea of Shalit’s current condition, and did not even know if the soldier was still being held in the enclave. 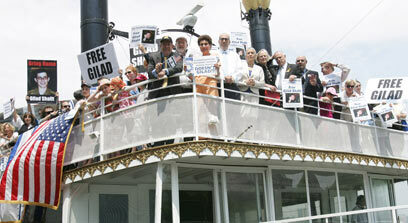 Israelis are preparing for a march for Gilad Shalit, starting next week, but New Yorkers have already set sail in a call for his release. The “True Freedom Flotilla” for the captive soldier set sail on Thursday from Pier 40 on the Hudson River, en route to the Statue of Liberty and then to the United Nations building. The sail includes two vessels, each carrying 600 people. The passengers include Israeli Ambassador to the UN Gabriela Shalev, New York Consul-General Asaf Shariv, France’s deputy consul and a representative of the International Red Cross, who is slated to receive from Shalev a package meant for Gilad Shalit, containing undergarments, a pair of glasses and food. The event was organized by the Conference of Presidents of Major American Jewish Organizations, an umbrella group of 51 organizations throughout the United States. The conference’s Executive Vice Chairman Malcolm Hoenlein noted that the Red Cross was prevented from seeing Gilad Shalit just last week, while Israel allows some 15,000 to 18,000 tons of humanitarian aid into the Gaza Strip each week. The secretary general of an Iranian organization supporting Palestinians, Hussein Sheikh el-Islam, said during a press conference that the main reason for the cancellation was “the violent and inhuman attitude of the Zionist regime to humanitarian aid.” The vessel’s intended voyage was originally announced by the Iranian Red Crescent. “The vessel was supposed to leave for Gaza on Thursday, but because of hurdles put up by the Zionist regime regarding the impossibility of getting some of the goods (into the Strip), it was decided to postpone the departure to Sunday, but now this too will not happen,” Sheikh el-Islam was quoted by the Iranian news agency IRNA. New York’s Jewish community marks four years since the abduction of the Israeli soldier by Gaza militants. The name chosen for the event echoes the name of a recent 8-ship flotilla that sailed from Turkey toward Gaza to break the Israeli blockade on the Hamas-ruled territory, which was named the Freedom Flotilla. The flotilla was to encircle the Statue of Liberty and then sail to United Nations building. The two-hour event was to involve seven vessels: The Queen of Hearts which can hold up to 600 passengers, another smaller boat and five privately owned yachts. The flotilla was organized by the Conference of Presidents of Major American Jewish Organizations, an umbrella group of American Jewish organizations. Israel’s mission to the UN has also joined the initiative, as did Israel’s Consulate General in New York. Boats were scheduled to move north on the East River at 12:00 noon New York time on Thursday, June 24th from Houston Street and West Side Highway. The flotilla can be viewed from the East River Esplanade. Entrance to the Esplanade is on the east side of First Avenue at 34th, 35th or 37th Streets. “For four years, Hamas has denied Gilad Shalit the most basic rights, including visits by international organizations,” Israel’s ambassador to the UN said on Thursday, adding that this was both illegal and immoral. 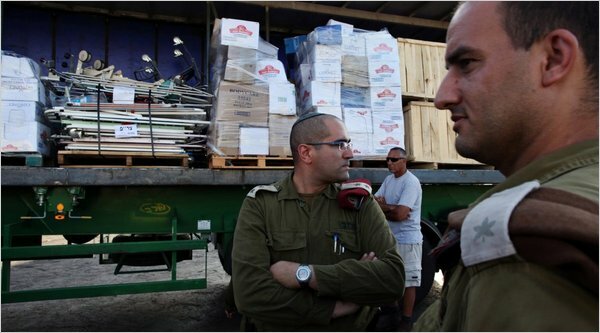 Joel Lion, the Spokesperson and Consul for Media Affairs at the Consulate General of Israel in New York, has put together a package full of clothing and food which was to be handed to a Red Cross representative to be brought to Shalit though the organization’s international channels.